Taiwan’s relationship with foreign aid provides an excellent example of how aid can lead to sustainable development outcomes. In 1949 Taiwan was very poor. It had gained its independence from Japan after World War II, but simultaneously lost its largest trading partner—Japan. As such, the tiny island of roughly eight million people found itself in a politically liberating, but economically precarious, situation. The average per capita income of Taiwan was $100 and 60% of the population engaged in agriculture, most of which was for subsistence. In addition, with the exception of some textile factories, sugar refineries, and food processing plants, Taiwan practically had no industries. Taiwan, at the time, looked similar to many poor nations today, but fairly quickly, its economy began to change for the better. Foreign aid, especially aid from the United States, is often cited as a critical factor that helped Taiwan develop. And indeed it was. On average, each year between 1950 and 1965, Taiwan received roughly $100 million in economic aid from the United States. That accounted for approximately 10% of the small nation’s GDP. By 1965, however, Taiwan had successfully weaned itself off foreign aid and was well on its way to becoming one of the most successful 20th century economic transformations. Taiwan’s story often serves as evidence that foreign aid works, but we must understand that the purpose of aid in Taiwan was similar to that in South Korea: to end aid. In order to do this, Taiwanese officials had to match many of the aid projects in their nation with their local capabilities. Many innovations, as well as foreign-aid projects, fail not because of some fatal design flaw or for a lack of planning. They fail because the responsibility to execute and sustain them is given to people, organizations, and governments that are not capable of succeeding due to limitations in their capabilities. 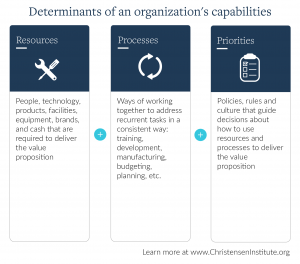 Understanding what capabilities are and how they can impact the result of a project even before the project begins can help many development organizations predict the likelihood of success—or failure—in the work that they do. So, what exactly are capabilities? 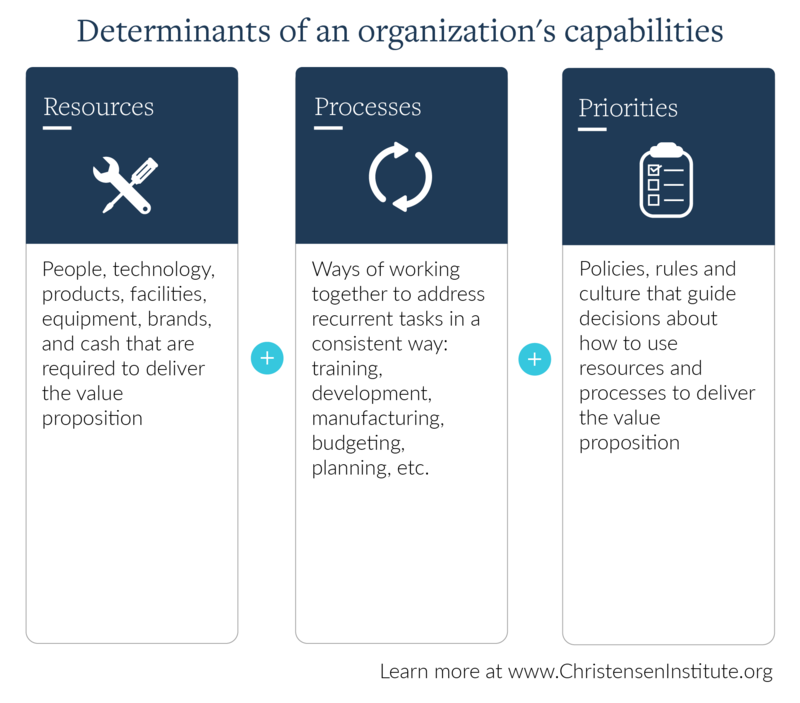 An organization’s capabilities are determined by three elements in its business model: resources, processes, and priorities. Resources are the most tangible of the three. They include people, equipment, technology, cash, buildings, intellectual property, and many other assets. Resources are the most easily bought and sold of the three elements. Processes are the patterns of interaction, coordination, communication, and decision making through which organizations create value as they transform inputs of resources into products and services of greater worth. Processes include things like, how an organization conducts market research, hiring, budgeting, and other aspects of its business. Some processes are are explicitly defined, documented, and followed while others are habitual routines of ways of working together that have evolved over time. Priorities affect what an organization can and cannot accomplish. Priorities are essentially the policies, rules, and culture that have emerged over time to guide decisions about how organizations use their resources and processes. For example, many mainframe computer companies found the PC business too small and unprofitable because their machines sold for orders of magnitudes more than personal computers. Their policies had emerged to prioritize bigger and bigger mainframe sales opportunities. In the same way organizations have capabilities, countries also have specific capabilities. For example, some countries have an abundance of natural resources while others have developed resources such as excellent higher education institutions, patents, and efficient infrastructures over time. In terms of processes different countries have very specific ways of doing things. For example, the length of time it takes to register a business, the steps necessary to certify a drug, become a doctor, or run for office, all constitute processes specific to individual countries. As per priorities, some countries prioritize government social welfare programs while others don’t see the role of government as being so involved. Countries, just like organizations it turns out, have vastly different capabilities. In receiving aid, Li Kuo-ting, Taiwan’s Secretary General of the Council for U.S. Aid from 1958 to 1963, made decisions regarding whether to support projects based on Taiwan’s technological and managerial capabilities at the time, and not on the size of the project or the potential financial impact to Taiwan. As the government built more and more capabilities, it took on increasingly complex projects. One of the things that often happens in the global development industry is that many projects are executed without ensuring that local capabilities are developed enough to maintain such projects. Unfortunately, this practice leaves too many poor countries with good, but highly technical and advanced projects that don’t work in their contexts. Hospitals are provided with advanced medical equipment that they can neither use nor repair; computers are donated in regions without electricity; and schools are built without trained teachers and contextual curriculums. I am not suggesting that the aid spigot be turned off around the world while local economies struggle to develop the right capabilities. What I am instead suggesting is that more development activities consider the local context and focus on the goal of helping build capabilities that can help the local economy develop itself. 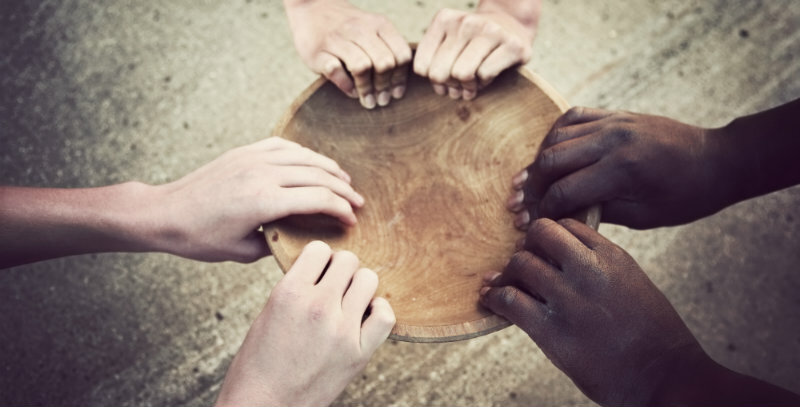 Aid can go a very long way in helping communities lift themselves out of poverty if it’s directed to the right place and in executing the right activities.